The Kill Bill movie references guide - famous all over the internet, the most complete guide to the references. 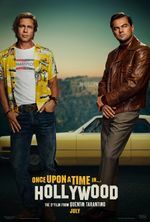 March 18-20: Once Upon a Time in Hollywood adds posters, teaser trailer, official website, and more! Django Unchained is Quentin Tarantino's latest script and new movie! More information coming as we get it, check out the pages. Read our latest analysis: Death Proof: Deconstructing The Slasher Film, a theoretical commentary. Make sure to pick up the Tarantino scripted crime classic True Romance on Blu Ray! This page was last edited on 20 March 2019, at 19:35.